Murray County is located in the southeastern quarter of Oklahoma, surrounded by Garvin, Pontotoc, Johnston, and Carter counties. Named for William H. "Alfalfa Bill" Murray, president of the 1906 Constitutional Convention, Murray County has a total of 424.92 square miles of land and water, making it the third-smallest county in the state. The county's northern section lies in the Sandstone Hills physiographic region and is suitable for farming, while the southern portion is in the Arbuckle Mountains region, which is dominated by rolling hills and rock outcrops. Fed by Falls and Rock creeks and other tributaries, the Washita River drains the county. Lake of the Arbuckles was completed on Rock Creek in 1966. Sulphur is the county seat. Prehistoric peoples occupied at least thirty-two sites in the county for brief periods. Seventeen of these archaeological sites are Archaic (6000 B.C. to A.D. 1) and one is Woodland (A.D. 1 to 1000). Later, Caddoan peoples such as the Quapaw and Wichita hunted there, as did Osage and varied Plains Tribes. The area was originally part of the land granted to the Choctaw Nation by the Treaty of Dancing Rabbit Creek in 1830. The Chickasaw obtained a claim by the Treaty of Doaksville in 1837, and the region became part of the Chickasaw Nation in 1855. A succession of forts (Fort Towson, 1824; Fort Washita, 1842; and Fort Arbuckle, 1851) offered limited protection to the Chickasaw in the decades prior to the Civil War when the area was recognized as part of "Scalp Alley," the borderline of conflict between Plains Indians and Choctaw-Chickasaw settlers. Problems with the Plains Indians ended within a decade after the war, but difficulties with outlaw bands that frequented area caves presented new problems for Chickasaw and federal law enforcement agencies alike.In 1870 the U.S. General Land Office established the Initial Point, the basis for all subsequent surveys in Oklahoma except the Panhandle, at a site just south of old Fort Arbuckle and six miles west of present Davis. Long recognized for its grazing potential, Murray County included a number of ranches within its realm. Earlier, the abundant grasses that drew plentiful game had given the area the designation "the Prairie of Eden." Chickasaw ranchers Noah Lael and Perry Froman operated and headquartered near Sulphur by 1881. Settlements of farmers and businesses expanded through the decade, spurred by the completion of Atchison, Topeka and Santa Fe Railway lines in 1886–87 through Dougherty and Davis. Post offices were established at these locations in 1887 and 1890, respectively. In the meantime, Sulphur began development around the springs from which it took its name. The springs encouraged the location of bathhouses and spas. Several were established by the time that community added a post office in 1898. The Sulphur Springs Railway (acquired by the St. Louis and San Francisco Railway in 1907) arrived there in 1902, and the 1904 establishment of Platt National Park, with headquarters at Sulphur, spurred the expansion of services for health seekers. Other visitors were drawn to the park and to nearby Turner Falls, making Sulphur one of the state's earliest recreational centers. The town grew accordingly, and its population of four thousand at 1907 statehood made it the choice as county seat. The location of the State School for the Deaf and a Veterans Center added to the region's economy. Limestone quarries were also significant. The most important example of this activity began in the 1890s at Big Canyon, home to operations of the Dolese Brothers, whose company became a major state employer. Cattle ranching, the other primary industry, continued into the twenty-first century, and Murray County has long been recognized as the center of "Hereford Heaven." Notable ranching operations included those of Oklahoma Gov. Roy J. Turner. On New Year's Eve, 1947, the Flying L Ranch near Davis was the site for the marriage of Roy Rogers, "King of the Cowboys," and Dale Evans. Murray County's population grew slowly from 12,744 in 1910 to a high of 13,841 in 1940. That number declined thereafter to a low of 10,622 in 1960 before the trend gradually changed. In 1980 the census counted 12,147 and in 1990, 12,623. Economic development and population growth were spurred in the late twentieth century by major improvements at the Chickasaw National Recreation Area (formerly Platt National Park) and expanding investments by the Chickasaw Nation. In 1980 the census counted 12,147 and in 1990, 12,623. Economic development and population growth were spurred in the late twentieth century by major improvements at the Chickasaw National Recreation Area (formerly Platt National Park) and expanding investments by the Chickasaw Nation. The 2000 population was 12,623. In 2010 the county had 13,488 residents, of whom 78.0 percent were white, 12.1 percent American Indian, 1.3 percent African American, and percent Asian. Hispanic ethnicity was identified as 4.9 percent. Incorporated towns include Sulphur, Dougherty, Hickory, and Davis. In addition to ranching, tourism, and recreation, retail trade and health care and social assistance were the leading industries during the early twenty-first century. Principal north-south routes through the county are provided by Interstate 35, U.S. Highways 177 and 77, and State Highway 110. State Highway 7 intersects the county from east to west, and the Chickasaw Turnpike extends northeastward from near Sulphur into Pontotoc County. 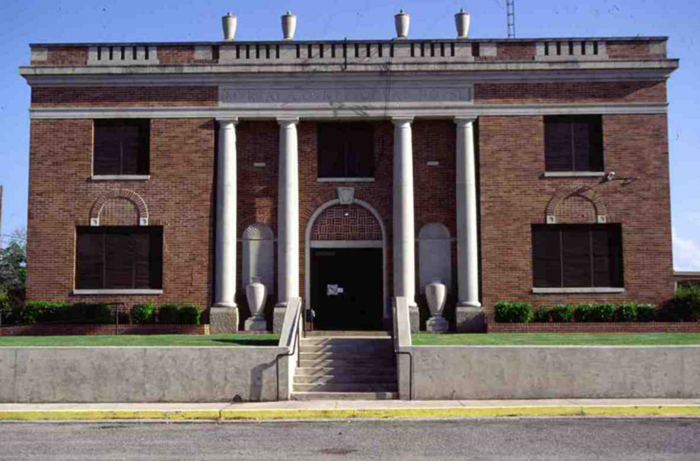 National Register properties include the Davis Santa Fe Depot (NR 94001507), the Initial Point (NR 70000533), the Sulphur National Guard Armory (NR 94000487), the Murray County Courthouse (NR 84003352), the Historic Downtown Sulphur Commercial District (NR 01000662), and the Lowrance Springs Site (NR 75001567). "Murray County," Vertical File, Research Division, Oklahoma Historical Society, Oklahoma City. Alvin O. Turner, "Murray County," The Encyclopedia of Oklahoma History and Culture, https://www.okhistory.org/publications/enc/entry.php?entry=MU011.